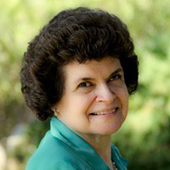 Demonstrating business value is a continual challenge for the UX community…. If you’re interested in learning more about the business value that field studies provide, read on. A developer of drawing and database software for chemists needed to replace a legacy drawing tool from 1996 with a second-generation product that used more advanced technology. 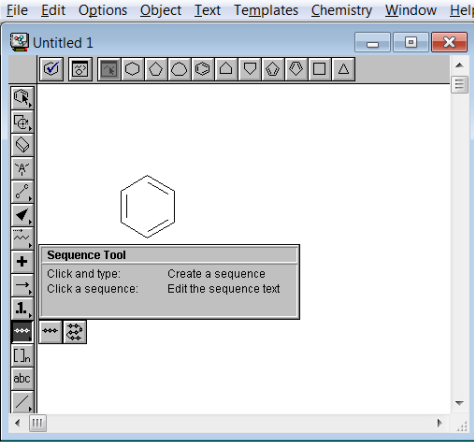 One feature of the legacy product was a tool palette with two specialized drawing tools—the Sequence Tool and Sequence Shape Tool, shown in Figure 1. A small minority of chemists used these tools to represent protein structures as sequences of single-letter, amino-acid codes. Because the market for this product was so small, the company could’t justify spending large amounts of resources on implementing these tools in the new product. To reduce the scope of the product release while still meeting users’ needs, we needed to find out which features were most important to chemists and ensure that those features got implemented in the new product. We decided to do field studies to provide the answers. To reduce the scope of the product release while still meeting users’ needs, we needed to find out which features were most important to chemists and ensure that those features got implemented in the new product. Our team made two visits to a customer site. On the first visit, our goal was to observe chemists as they used the legacy tool, note where they had problems, and ask questions when they did something we didn’t understand. To interview as many people as possible, we organized into two-person teams consisting of one marketing person and one developer or technical writer, and in this way, we managed to observe over a dozen chemists at work. A year later, we spent another week at the same site conducting usability testing on the beta release of the tool. As the technical writer on the team, I not only interviewed users at the customer site, but transcribed our notes from the study into a detailed, 20-page report that showed exactly what customers were trying to do and why they were doing it. Our research showed that the legacy product was cluttered with features that the chemists never used. 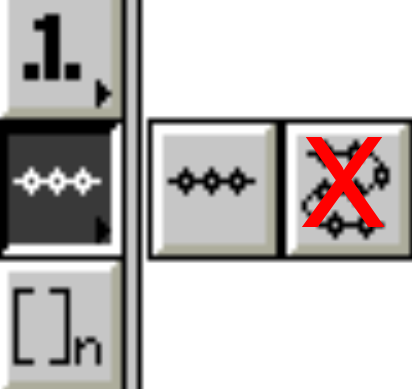 For example, users had no use for the Shape Tool. 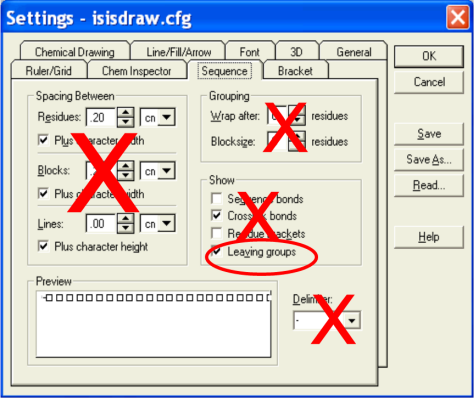 We discovered that the Leaving groups check box in the Settings dialog box, shown in Figure 3, was the only option that the chemists actually used, making the remaining twelve controls unnecessary. In addition to eliminating unnecessary features, we also saw that the legacy product lacked direct support for fully one-third of the most common user tasks. The product team had been completely unaware of three of the missing tasks before the study. For example, we discovered that it was extremely important to chemists to be able to represent chemical structures using the standards that chemical journals required, as shown in Figure 4. The legacy product provided two display options for chemical structures, neither of which fit the standard, as Figure 5 shows. This feature was so important to the chemists that the system administrator had created a custom application to provide the necessary display. Without our field study, we might have dismissed the requirement for this feature as “only cosmetic” and eliminated it from the release! It’s all very well and good to show how field studies helped to eliminate unwanted features and discover users’ unmet needs. But can we quantify that? It’s all very well and good to show how field studies helped to eliminate unwanted features and discover users’ unmet needs. But can we quantify that? Let’s return to the two metrics that I mentioned earlier: The 50% reduction in scope and the 300% return on investment. Before we conducted our study, the marketing department had identified 61 user tasks that they thought the product should support. Expressed in users’ terminology, each task represented something that users would want to accomplish. I entered all of the tasks into a spreadsheet and added three columns to indicate which tasks we had known about before our field study, which tasks the legacy product supported, and which tasks we observed at the customer site. Figure 6 shows part of this spreadsheet. The study had revealed three tasks that we hand’t previously known about, indicated by N in the Known Before Field Study? column. Our discoveries raised the total number of tasks to 64. 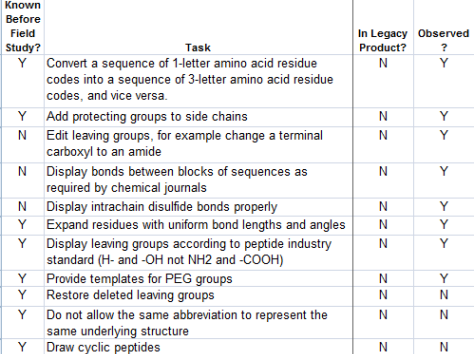 We knew, however, that chemists performed only 27 of these tasks every day, as indicated by a Y in the Observed column. Our field study had demonstrated that we could omit as many as 37 of the 64 tasks, for a scope reduction of over 50%. Our field study had demonstrated that we could omit as many as 37 of the 64 tasks, for a scope reduction of over 50%. 4 weeks conducting user research for the Sequence Tool—This included 2 weeks of customer site visits and 2 weeks for report writing. 13 weeks on product documentation—In addition to the time I spent producing customer-facing documentation, this includes the time I spent in design meetings and doing in-house usability testing. If we had not been able to cut the project scope in half, I would have spent at least twice as much time on product documentation—a total of 26 weeks. The 4 weeks I spent on research eliminated 13 weeks of unnecessary work on documentation, for an ROI of over 300%—13 weeks versus 4 weeks. These cost savings are a conservative estimate because I was tracking only my own time. My figures don’t include the time the nine other members of the product team saved because they didn’t need to program, test, or fix bugs in the features that users did not need. I hope that this case study will stimulate more discussion of metrics in the UX community. I look forward to hearing from other UX professionals about their use of metrics.